An environment is the set conditions within a given area. These can include; temperature, amount of light, types of predators and prey, rainfall, the pH of soil, the salinity of water and the number of different species living in the area. Environmental factors can be separated into two groups: living and non-living. We can classify all livng things into two groups; living and non-living. All living things have the following; need energy, need air, produce waste products, can move, respond to changes in their environment, grow as they age and can reproduce themselves. An ecosystem includes all the living and non-living environmental factors of an area and how they interact with one another. The relationship that each organisms has with the environment is unique. List what you would expect to find in the following ecosystems. Divide your list into living and non-living. An ecologist is a scientist who studies ecosystems and the changes in environments. They use a number of techniques to determine what organisms live in each unique ecosystem. A tree scan is a method whereby a funnel is installed around the trunk of the tree, just below the canopy. A fast-acting natural insecticide is sprayed into the canopy. This kills the insects quickly and the bodies drop into the funnel. Scientists can then analyse and study the small invertebrates they have collected. A pitfall trap is used to collect ground-dwelling inhabitants that live in a particular location. A pitfall trap is particularly useful for studying nocturnal animals. The trap would be opened during the evening and checked the next morning. Scientists catch the birds in nets first. 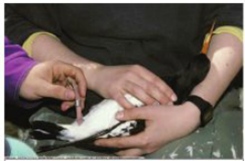 The birds are then banded by fastening a small, numbered metal band around one of its legs. Details such as the weight, wing length, head length and the age are recorded. This can then be compared with data if the same bird is captured again. What are some other techniques scientists use to gather data about organisms? Answer these questions in full sentences. Explain the difference between an environment and an ecosystem. Name four living and four non-living factors in an ocean ecosystem. What is one disadvantage of using a tree screen? What can scientists determine from a hair sample analysis? When scientists are collecting water from creeks or lakes, they take a number of random samples. Why do you think they do this? What ethical responsibility do humans have towards the natural ecosystems?